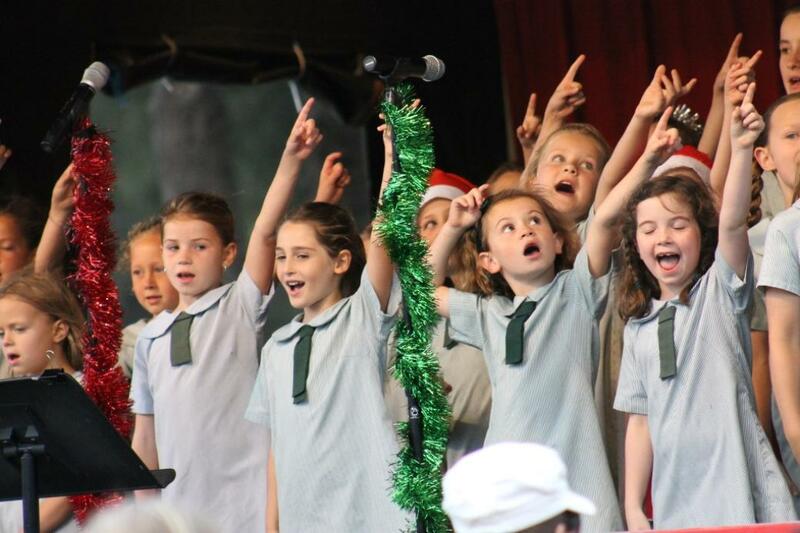 Children from Sacred Heart Mona Vale Catholic Primary School who opened this year's Carols in fine voice. 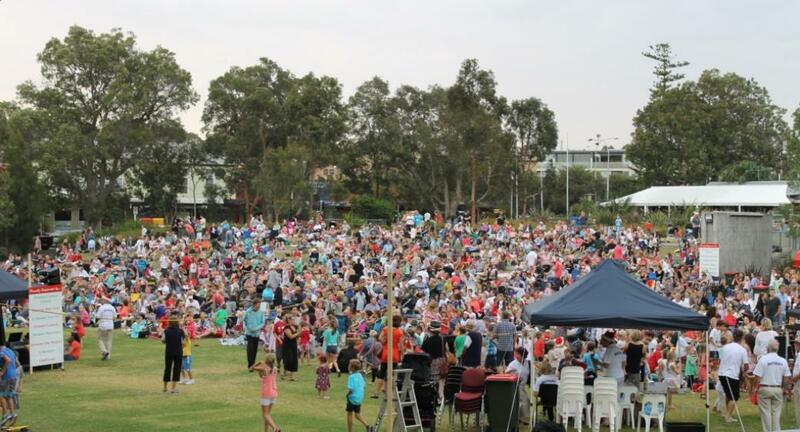 Last night over 3000 people attended the annual Rotary Club of Pittwater's Christmas Carols in the Village Park at Mona Vale. 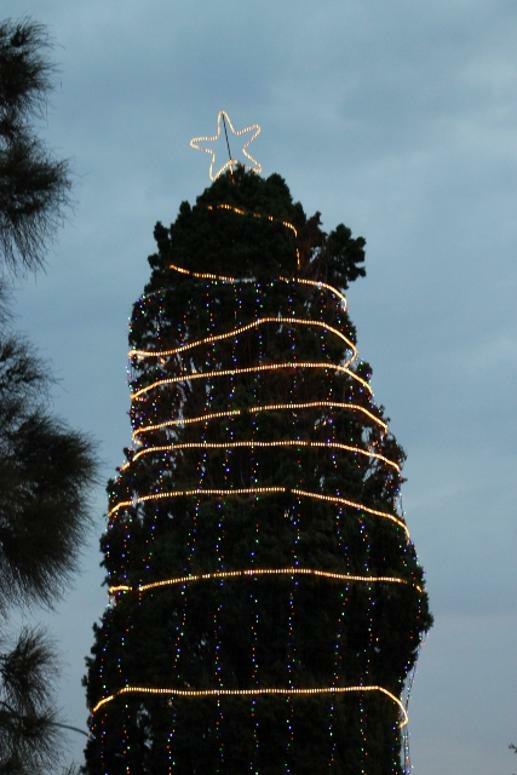 The very young, their parents, grandparents and friends enjoyed two hours of classic Christmas Carols and a few new tributes to the blessing the birth of Jesus represents to people all over the world. To open the programme children from Sacred Heart Mona Vale band and choir played and sang and danced, clearly enjoying themselves. Cheers and applause was the response from their audience. The Pittwater Uniting Church band of Wes Harder (Musical Director and piano), Scott Wheeler (drums), Jared Castaing (bass), John Dacker (guitar) and Glen Naveau (acoustic guitar) provided the music for all featured artists. 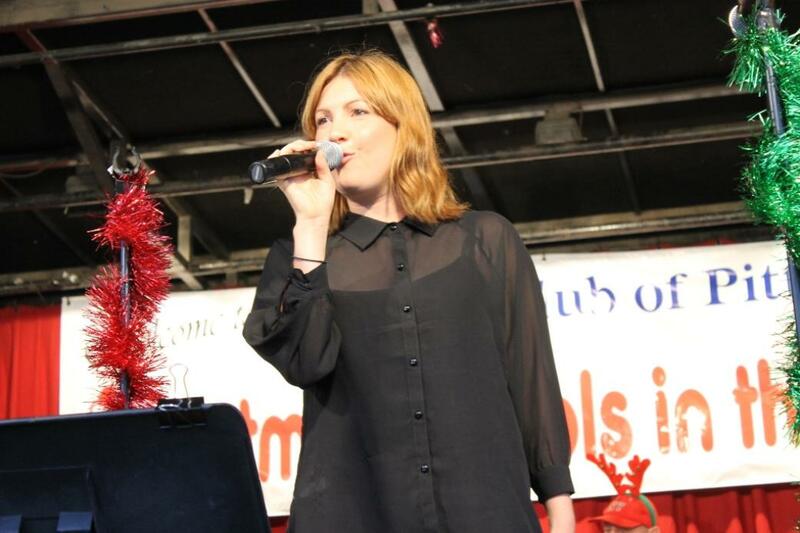 Allison Harder, her ninth year of singing at the Carols in the park, led all in a rousing version of Santa Claus is Coming to Town' as the big man in red arrived and shared a new dance called 'Santa Style'. 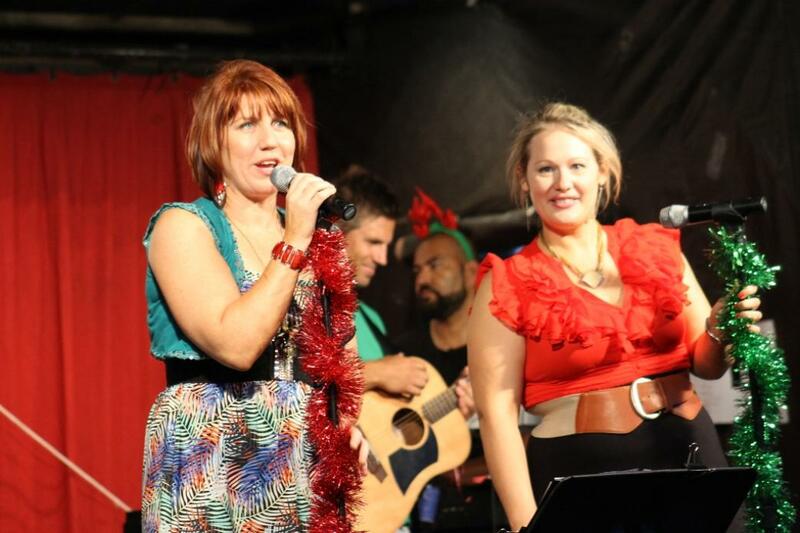 Other featued artists included the great voices of Lucinda Castaing, Jo Laub, Bek Tanner, Phil Watson and the divine Samantha Shaw. 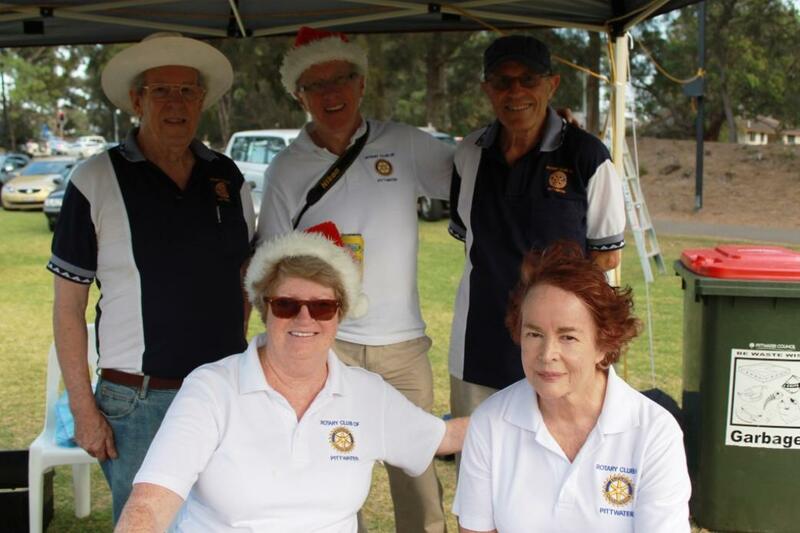 MC for the evening, and for many Rotary Club of Pittwater events, Bruce Lakin invited special guests Hon. Bronwyn Bishop, MP for Mackellar, Hon. 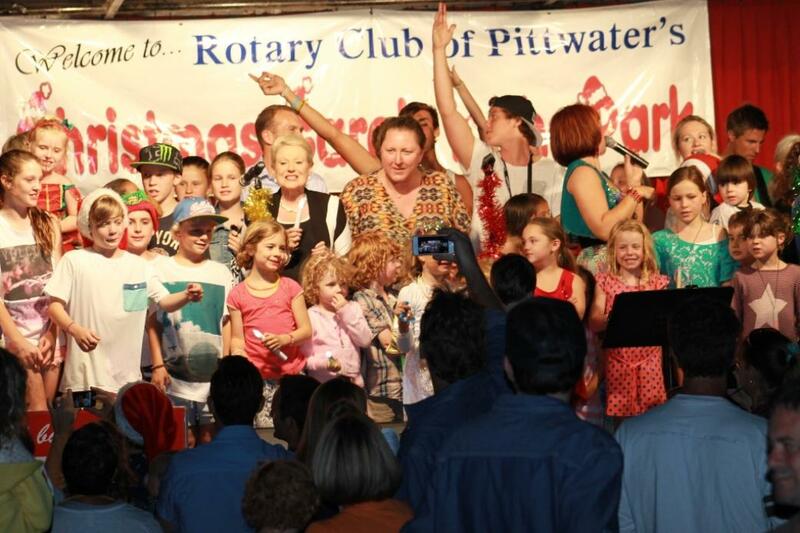 Rob Stokes, MP for Pittwater, Pittwater Councillors and children attending on to the stage for the finale. 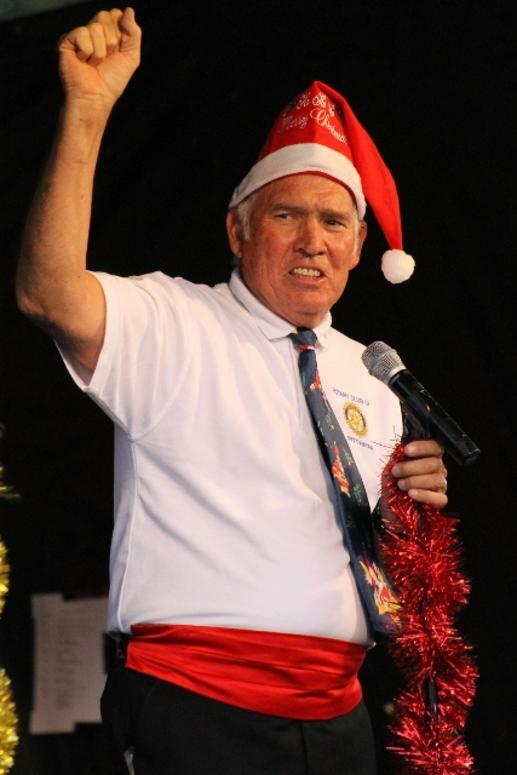 In closing Mr Lakin wished the whole of the community a very safe and happy Christmas and a prosperous New Year on behalf of the Rotary Club of Pittwater. 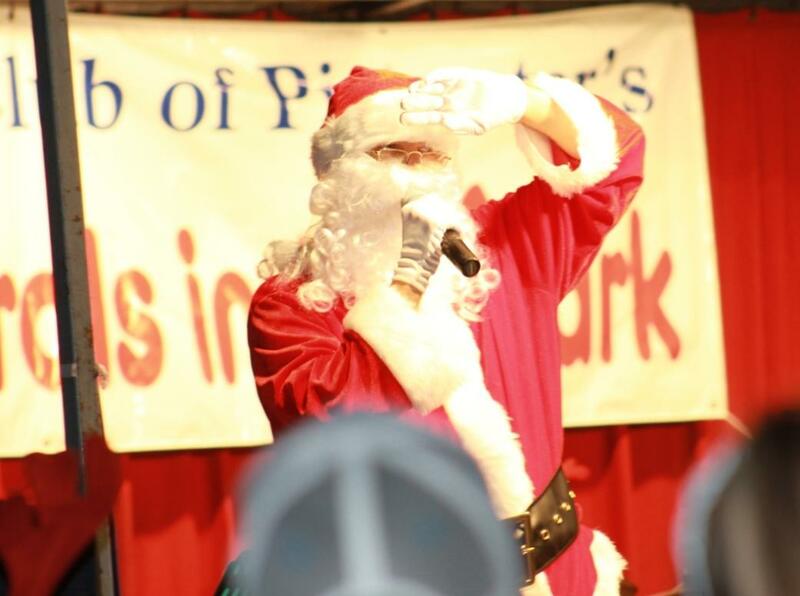 Santa Claus, with thanks to the Mona Vale Fire Station. 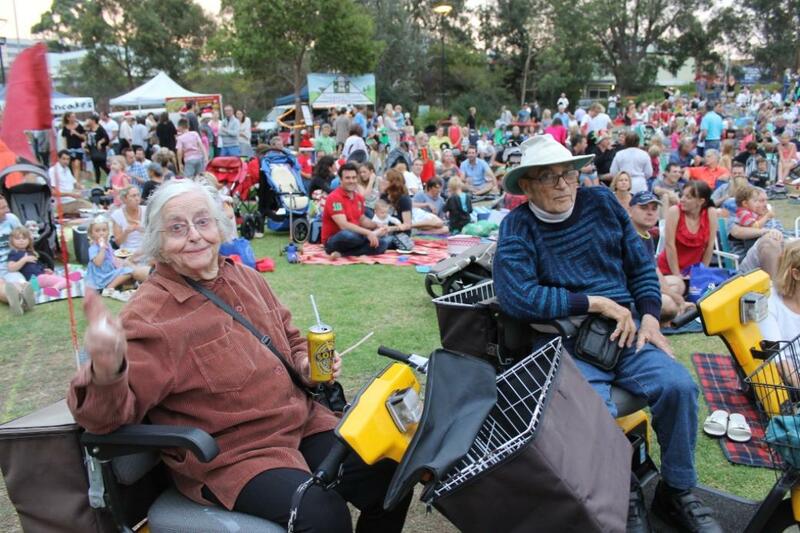 Deputy Mayor of Pittwater Cr. 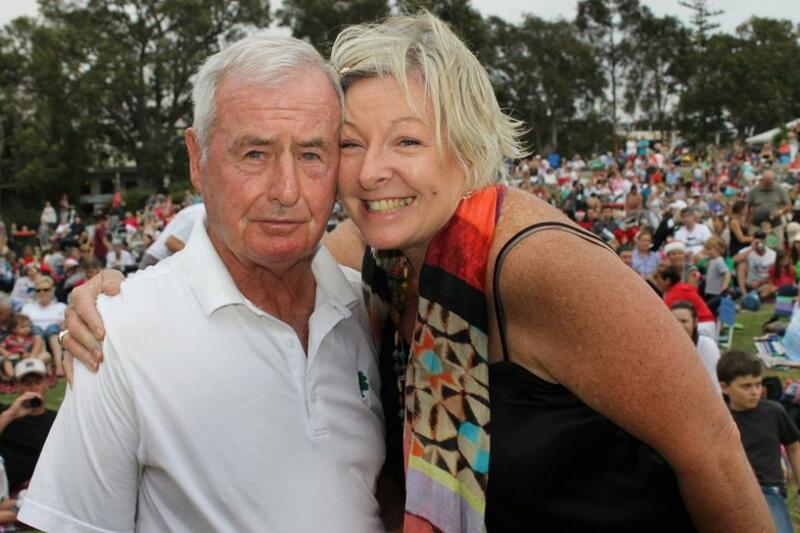 Bob Grace and Mayor of Pittwater, Cr. 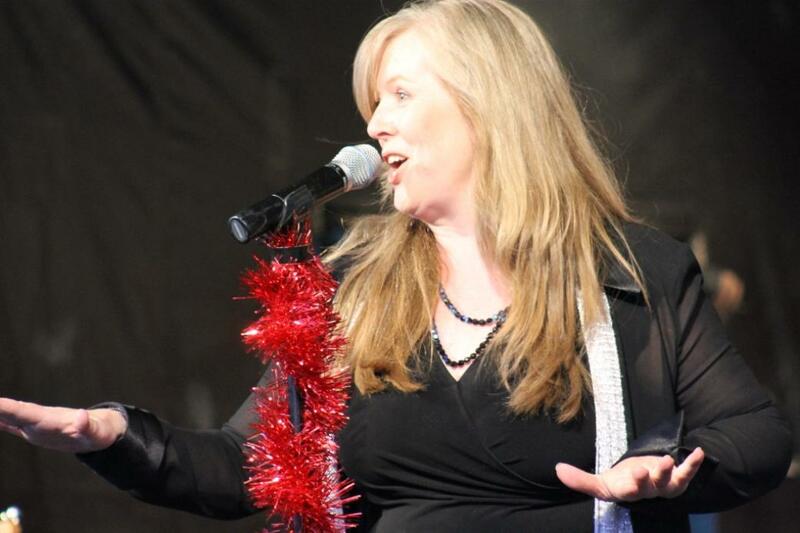 Jacquiline Townsend getting into the spirit of this great community event. 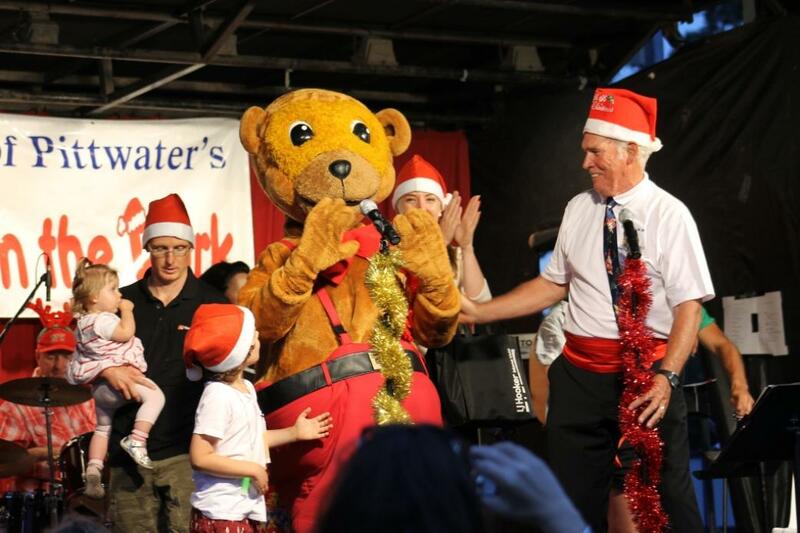 This giant 'teddy bear' was very popular with the children, pictured here with MC Bruce Lakin, Rotarian. Bruce Lakin, Rotarian and MC for the Evening . Report and Photos by A J Guesdon, 2012.